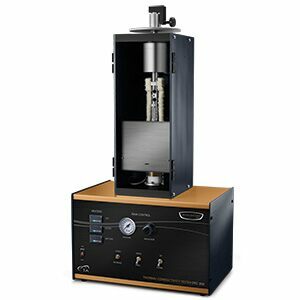 A research grade instrument for the direct determination of thermal conductivity of a wide range of low-to-medium thermal conductivity materials, including solid, liquid, paste, powder, thin film by using guarded heat flow method. DTC 300 is a guarded heat flow meter measuring the thermal conductivity over a wide range of temperatures accordingly to the ASTM E1530 Standard. It employs one calorimeter module, located in the bottom stack, for the measurement of thermal conductivity, and a side guard furnace to prevent edge heat loss. The contact resistance is minimized by applying a pneumatic load to the test stack, and by using a thermally conductive interface compound. The test specimen is held under a user-selectable compressive load between two polished metal surfaces. TThis reproducible, pneumatic load to the test stack also helps to minimize the contact resistance. DTC 300 operates from -20°C up to 300°C For sub-ambient testing, the DTC-300 is supplied with an airtight compartment, keeping the atmosphere relatively moisture-free with dry air purge. Polymers can be tested through the melt using special containment cells. Each DTC-300 system includes a Windows™ operating and data analysis software. 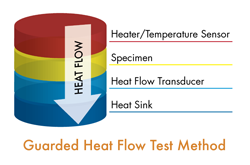 Once the user specifies test parameters as specimen size and desired test temperatures, the equipment runs unattended until test completion, when thermal conductivity results are printed and plotted.